I was raised by a family in law enforcement, and as such, I tend to think people who are arrested are usually guilty. And I think that the people who are ending up inside the Florida bankruptcy courts are usually going to be people that shouldn’t be in their homes. It’s because of the fact that I and others usually believe this to be true that I think due process and the trust in the process of our courts is so incredibly important. It’s necessary to force the parties at hand to marshall evidence that they swear is true, and to present it to an impartial judge to render judgment after full consideration. This is America, where everyone gets a chance before the court. If this breaks, the weak and the innocent are the ones who suffer. This is right. It’s precisely when we’re absolutely sure that someone is guilty that we need to be most careful about making sure we actually prove it. Beyond that, as Mike points out in the rest of his post, virtually all of these foreclosure problems could probably be resolved quickly and fairly amicably if banks were simply willing to share the loss with the homeowner. But they’re not, and neither Congress nor the president has been willing to change the law to encourage this. It’s all about protecting the banks, not anyone else. Read the whole thing, and then click the links to read a bit more. 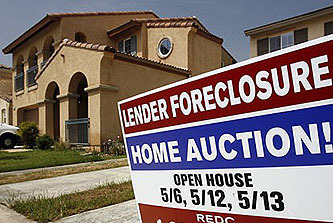 I think Obama probably gets more flack for his economic policies than he deserves — for the most part they’ve been about as good as they could have been under the circumstances — but when it comes to home foreclosures the administration and Congress have been cynical and derelict in the extreme. It’s a disgrace, whether Rick Santelli likes it or not.